Ever since his election in 2005, Benedict XVI has been a pope I could relate to the most. Don’t get me wrong! I greatly admire John Paul II as an inspiration for my entrance into seminary and to my involvement in the Air Force Chaplain Candidate program following September 11. But Benedict XVI has a humility and a particular personality that reflected my own. An academic and an intellectual, Pope Benedict seems a more reserved person than John Paul II. Benedict’s manner seems to be more avuncular, more approachable (even though I’d never met him personally). The more I read his writings, the more I glean solid spiritual insights. More than any of these, however, is the grace of Pope Benedict to step aside and let the power of Christ shine through him. We have always gotten the sense that it is not Benedict we should be focusing on, but Christ, whose vicar he is. His recent decision to step down from the papacy, while a shock, has gone further to unveil this part of him. Yes, he has been called “Holy Father,” and yes, that title has suited him so much so that I have felt quite secure with him at the helm, given the craziness that is going on in our world lately. With increased violence worldwide, a growing sense of selfish interests that run counter to natural reason, as well as the teachings of the Church, We have needed a gentle and solid pastor of souls that Pope Benedict has been. When I had first heard the news, I remember thinking, of all the times for this to happen, please, Lord, not now! We need a strong leader! Yet, it has been observed that while John Paul II had taught us how to suffer and die with the dignity of Christ on the cross, Pope Benedict has taught us the value of discerning and recognizing our individual limitations. To discern what I can handle and having the strength to admit those things that are beyond my capability and letting those things go. His latest two Wednesday audiences dealt with God the Almighty Father, first showing us what it means to be a Father: generous, faithful, merciful, and how by sending His Only begotten Son, God shows us the depths of His love through the cross. This image Christ brings of the invisible God flies blatantly in the face of our own fallible human notions of power and prestige. The Book of Genesis shows us God’s creative majesty as a Father who seeks out from his creatures – his children – an authentic response to that love which God Himself initiates. The paradox of humanity lies precisely in our smallness and frailty compared with the infinite magnitude of God. Yet, that comparison is meant for coexistence, to show God’s eternal love to us who are weak, and thereby claiming that divine and infinite love as the basis for our ability to move forward in doing His will. My guess is that Pope Benedict realized this paradox and, through deep prayer and discernment, chose to show the world the greatness of God’s love by demonstrating his own frailty and weakness. When human beings are placed in positions of power and leadership, very often they don’t know how to fill that role which is so often too big for them. Human beings so often deceive themselves into thinking that they can handle it, and cling to it with an arrogant pride. When that happens, that is when the mighty fall. Pope Benedict from the very beginning realized that the office to which he has been entrusted was not his to manipulate, but was an opportunity to empty himself more fully into the loving will of God. St. Paul’s letter to the Philippians states: “Though he was in the form of God, [Jesus] did not count equality with God a thing to be grasped, but emptied himself, taking the form of a servant, being born in the likeness of men” (2:6-7). The world may look upon this decision as weakness. The world may even see this as a benefit since it did not appreciate the message he was sending. 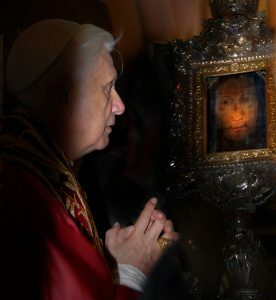 but Pope Benedict – above all – realizes it is precisely in weakness that he is strong, for it is the power of Christ dwelling in him that sustains him. As I stretch myself to try new things, I must accept the lesson Pope Benedict has given and be willing to step aside from activities that are beyond me and listen to the still small voice of Almighty God whispering His will to me. May I — may we all – have the grace and strength to accept that will and abide by the Holy Spirit.